BOSTON, MA - The Bruins had been digging deep to get a win for Boston. In their past two games, they fell short. But on Sunday, they came out on top, shutting out the Florida Panthers 3-0. Tuukka Rask bounced back for his fourth shutout of the season, the 15th of his career, while Jaromir Jagr put up his second as a Bruin, Dougie Hamilton finally got to celebrate a win with his fifth of the year, and Brad Marchand sealed it with an empty-netter and his team-leading 18th goal. The game, as electrically charged as Wednesday and Saturday, was book-ended by another rousing national anthem sung by the entire TD Garden, and a postgame ceremony with the Bruins giving the "Jerseys Off Their Backs" to first responders from the Boston Marathon tragedy and this week's events. "That was great. It was a special moment. We feel lucky to have a chance to actually shake their hands and talk to them because not everyone has a chance to do that," said alternate captain Patrice Bergeron. "And we feel very lucky to do that, and I thought it was a great moment and a great gesture from the Bruins to actually do that, and for us it was easy just to give our jerseys and have a chance to see them, so it was a great moment." For the Bruins, to cap another energized game with getting the two points for their fans made it that much more special. "Yeah, it’s what you’re after," said Kelly on topping off the tough week with the two points. "I thought the previous two games we were starting to get back to our identity. It wasn’t the results we were looking for, but we’re starting to play our game." "A little more physical, a little more jump in our game, and that kind of continued over to today. I thought we played a solid 60 minutes." "Like I said after last game, even though we didn’t win the game I really liked the way we were physically and emotionally attached in the game," added Captain Zdeno Chara. "Today was a little bit different, but we found a way to win the game. That’s a good positive step." Jaromir Jagr put the B's on the board first just 3:03 in, showcasing his magnetized ability to attract the puck. He first stripped the puck from the Panthers earlier in the shift, before Carl Soderberg kept it alive in front of the net and Chris Kelly utilized a strong forecheck along the boards. Jagr stole the puck as Florida was trying to clear and wristed it over Jacob Markstrom for his second as a Bruin, his eighth point (2-6) in nine games wearing the spoked-B. It was the eventual game-winner, placing Jagr tied with Phil Esposito for most game-winning goals (118) all-time in the NHL. "It’s a very good accomplishment that’s for sure," said Jagr, before flashing his signature smile, "I score a lot of goals you know, I didn’t even know about it, I knew I was pretty close. But I got five games left, I'll try my best." Jagr, of course, is hoping another game-winner would help his Bruins get on a roll heading into the postseason. Though the B's were without Nathan Horton today (upper body, day-to-day), the forward corps has now been given an opportunity to find some chemistry and take a step forward. "It’s not fun to lose but I thought we played pretty good the last two games. I think we can play a lot better, I think we have 4-5 games left before the playoffs and I feel like we have to play a little bit better than we did," said Jagr. "I believe we can do it and it’s going to be important. I think it’s going to help us. Some guys don’t like to play so many games in such a short time but I think it’s going to help get us ready for the playoffs." Counting Sunday, the Bruins are playing five games within the next eight days. Sunday was supposed to be the final home game, but with the two rescheduled games against Tampa Bay and Ottawa, it leaves a tightly packed schedule heading into the postseason. "I don’t mind it at all," quipped Jagr. "I’d rather play the games than sit and wait." Chris Kelly won't mind the compact games either, especially after finding his groove back in the lineup following his injury, putting up three points in his past three games (1-2). He, too, knows the B's are on the right track. "That’s the plan. Every game, regardless of how late it is in the season, you want to get a little bit better," said Kelly, on heading into the second season. "You want to fine-tune your game. I don’t think it’s ever too late to get better as a team or as individuals." "You’re playing with new guys and you’re trying to form some chemistry and things like that. I thought all lines went deeper and played well today." Following the 3-0 shutout, Tuukka Rask, shared the sense of where he thought the team stood with five games remaining. "I think we’re going in the right direction," said the B's netminder. "I think we’re playing better hockey. Defense has been a lot better. I think that in the neutral zone we usually don’t give up chances to odd man rushes too much anymore, as we did a couple of weeks ago." "So I think we’re heading in the right direction but there’s still work to be done and I think the biggest thing for us, is try to get that good feeling about ourselves before going into playoffs and not second guessing ourselves." Before losses to the Islanders and Hurricanes last week, the B's had strung together five wins in six games. Following the long, emotional week, the past two games had been tough to criticize - the effort was there, but the results weren't coming. "The last two games it was an emotional [few] days. Everybody’s thrown off whack but we played really well," said Bergeron. "We lost, and it was extra frustrating because those games the guys wanted it so bad for people to leave the rink with an extra positive feeling." "We played better than probably the previous month in both those games, and we still lose, so it’s one thing, and we say it all the time, you can be proud of the way you play and sometimes you lose. That’s just the way sports go, but it is extra frustrating." "Today was nice to end with a positive note. Everybody has smiles on their faces. You get the points, and you get the win." Now having bounced the four-game skid, the B's feel that they're taking the next five games to get themselves ready. When Rask was asked if the B's will be ready to go come playoff time, he responded, "Yeah, 100%. There’s no doubt about that." "I think individually and as a team we know we can be better but we know that it’s just a matter of little things, us doing the little things and things turning around and going in the right direction." "Especially this time of year, we need the wins, but also, we know for the city it takes the minds off of everything that’s happened the past week," added Bergeron, on building off the win. "We’re all aware of that." "Also, good momentum towards the playoffs." Along with Nathan Horton, Adam McQuaid (lower body) was also listed as day-to-day. With McQuaid out against Florida and Matt Bartkowski being the defenseman rotating out to get rest, Dougie Hamilton was back in and Wade Redden played his second game as a Bruin. "I thought Redden was good today," said Coach Julien. "He’s a smart player, he moves the puck well, he sees the ice well, he makes pretty good decisions." 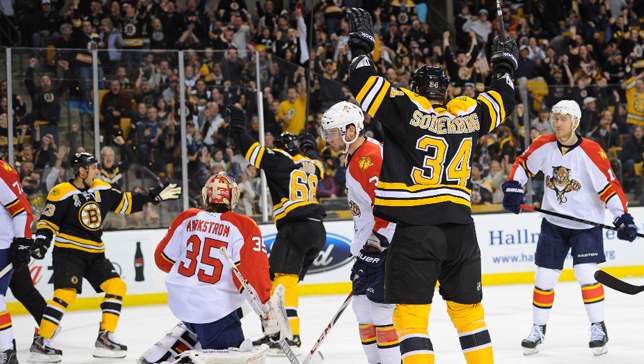 Carl Soderberg notched his first NHL point with an assist on Jagr's goal in his second game as a Bruin. After playing the wing his first game, he centered Jagr and Chris Kelly on Sunday. "To me he was better today than he was yesterday," said Julien. "It’s for him to get used to playing on North American ice and this kind of a game. And you know, to me he’s made good strides in his first two games. So he’s got four more games again to get better, and hopefully he’s a very confident individual and he will be good for us."